Nat used to be a trapeze artist! Ever thought of running away to join the circus? Well Nat did. Check out some cool flippy, flying photos below. Nat is also a video editor! She works for Sony Music and makes heaps of really cool content for really cool music artists. It's really cool! Nat was Fuzz the monster! 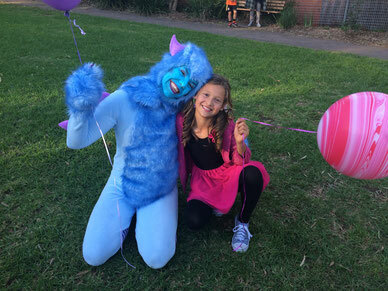 That's right, she played Fuzz the blue monster in kids' film 'Out From Under The Bed' which is now being developed into a TV series proposal. Nat was on a TV show! She was a contestant on reality TV show 'The Mole'. She didn't win (she didn't even come very close) but she had heaps of fun. See if you can spot her in the trailer!